T he yacht broker chattered away over the mutter of the launch's diesel engine as we snaked through the crowded mooring field at Cataumet, Cape Cod. He smiled and pointed at the sleek Bristol 32 my wife, Liz, and I had driven hours to see. The graceful, traditional lines were indeed beautiful, but the broker's smile vanished as we pulled up and he grumbled under his breath, "Oh, God. Not again!" The cockpit was covered in bird deposits ranging from white to gray, with some blueberry thrown in for contrast. The bimini was covered. The dodger, sail cover, coachroof, and foredeck were covered. Everything, in fact, was covered. It looked like every seagull and cormorant in New England had made a deposit on the Bristol that I, too, had fervently hoped to make my own sort of deposit on, only one involving greenbacks, not the stinky remains of bird chow. "That's disgusting," Liz said, wrinkling up her nose. Just then, a cormorant flew by, circled the boat, and started to come in for a landing on the masthead. The broker shouted. He waved his arms. But the cormorant glided in and landed with a lazy flap of its wings. We did the walk-through under the cormorant's watchful eye. It was still there as we drove off in the launch, as contented as it could be. On our way home, Liz said, "You'd think the owner would do something about those birds. If he really wants to sell his boat." But the fact is birds can be a real problem, and one not so easily addressed if you don't know what to do about it. Apart from the hassle of having to constantly clean up bird deposits, if left on too long they can do real damage. Dried to the consistency of glue in the sun, a big deposit from a well-fed cormorant, pelican, blue heron, seagull or duck can completely clog nonskid and leave a stain you can only get off with fine sandpaper. On Lexan, the deposit can cause crazing as the sun bakes the dark blot and overheats the Lexan. On canvas, it can rot the threads in seams. It can dissolve wax and degrade the finish on stainless steel and brightwork you spent hours making look nice. The birds themselves can twist antennas and bend wind vanes. In short, bird poop is no laughing matter. Entrepreneurs have come up with a variety of products to drive away bothersome birds. They include spikes, nets, brightly colored tape, spiders (yes, spiders, and not the eight-legged kind), balloons, solar-powered propellers and an expensive sonic bird blaster. Then, of course, there are those silly looking owls and snakes you sometimes see on boats, usually with a seagull perched next to them. While some sailors say the fake critters work, most say they don't. I've had my share of bird troubles, and I've found that the best way to deal with it is to go where the birds are not as interested in my boat. Naturally, this only works when cruising. I've also found that keeping my boat in a slip makes it less likely to get dumped on, but it still happens. On a mooring, the boat becomes a prime target. 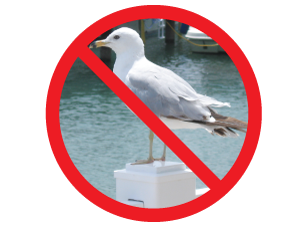 Ask any sailor about how to deter birds and you'll get a different answer as to what works and what doesn't almost every time. However, over the years I've found most sailors swear by what I call the Line Method. It comes in a variety of themes and variations, like a good fugue. Basically, you run a length of light monofilament fishing line from the mast to the end of the boom and tie it off on the topping lift or main halyard. Crisscrossing the foredeck with the line will keep birds from landing. You can run the line about 10 inches above the lifelines to stop birds from landing. Use a dowel or even a paint mixing stick to tie off each end of the line, and attach the dowel or stick to stanchions with Velcro. The next time a bird tries to land, it won't see the fishing line until it's too late. The unseen landing interrupter scares the birds away, and they tend not to come back. Another variation is to use thin copper wire, but such a system is difficult to stow. On a radar arch, you can erect a short pole (wooden or stainless steel) at the center, and then tie off the line on either end of the arch. The Line Method works great on spreaders too. The main drawback of the this method is the time it takes to rig. Even if you build a system using dowels, Velcro and line. A permanent system on a radar arch or spreaders works fine since you don't have to remove it every time you go sailing. What you do and how aggressive you get is all a question of how badly you want to keep deposits off your boat. I used the Line Method when I had to. It was less of a chore than cleaning up after a pterodactyl with the runs. Right behind the Line Method in effectiveness are spreader and masthead spikes. How they work is obvious. Birds won't land on something that's going to hurt them, and if they try, they'll quickly fly away. You can buy spikes for spreaders and mastheads, or you can make them easily enough with stainless steel nails protruding from a plastic base (cutting up an empty bottle of non-toxic antifreeze works), which you can attach to spreaders with light line or even cable ties. Some sailors even use long cable ties, the pointy end facing up, affixed to the spreaders. Mounting a long spike (about 12 inches) at the masthead will deter most large birds because they won't have room to roost. An ingenious system involves what I call the Spooky Flasher. I've never used it myself, but I hear it works wonderfully. Evidently, the rainbow effect of the grooved side of a compact disc shining in the sun frightens birds. Some sailors string a bunch of old CDs together a couple feet apart, grooved side up, and rig the string fore and aft. As the CDs sway gently back and forth in the breeze, they flash the birds, as if to say, "Stay away!" This system is easy to make, cheap (use old or sample CDs), simple to rig and unrig, and compact to stow. I would have tried it, if I'd known about it. By now you're probably starting to identify a pattern. To keep birds away, you have to scare them without hurting them. One of the cleverest things I've heard about is the guy who got so sick of birds fouling his boat he bought a bunch of pinwheels. You know, the kind you played with as a kid. He mounted them all over the boat: on the lifelines, pulpit, pushpit, dodger, sail cover. In even a slight breeze, the spinners turn, creating movement that scares most birds. Another way to go, but much less clever, involves deploying lengths of brightly colored tape (surveyor's marking tape works well) about a yard long and a couple inches wide at strategic locations around the boat, including on halyards and shrouds. When the wind blows, the tape flaps, spooking the birds. You can also use ribbons, the same ones you'd use to wrap a birthday present, or even flags. I know a guy who drinks lots of beer and instead of throwing the cans out, he strings the empties together to create a sort of "Gong Show" for birds. It looks terrible, but he says it works. I wonder, though, if it's worth it. Perhaps strings of jingle bells would be better, and certainly more festive. In either case, noisemakers are bound to really annoy your neighbors. Depending on where you keep your boat, they may work for you. You can buy light netting specifically meant to deter birds from landing on flower gardens. Or you can use the kind you buy to childproof lifelines. Even mosquito netting would work. You rig the net over large horizontal surfaces with lines, making sure it's loose and shaky. When a bird tries to land, it won't get a firm web-hold and will fly off. Nets are easier to deploy than a zillion lengths of fishing line, but you can't use them on lifelines. A combination of the Line Method, spikes and nets can work well. Birds can be pests, but they are part of the natural setting we all love so much. The birds are beautiful, just not when they make a deposit in the boat bank. Keeping them away takes a bit of effort, and yet that effort is well worth it.